Can Israel be both Jewish and truly democratic? How can a nation–state, which incorporates a large national minority with a distinct identity of its own be a state of all its citizens? 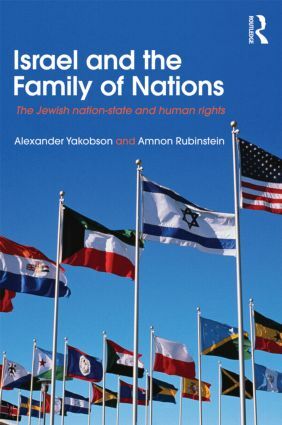 Written by two eminent Israeli scholars, a professor of constitutional law and a historian, Alexander Yakobson and Amnon Rubinstein are the first to treat Zionism and Israeli experience in light of other states’ experiences and in particular of newly established states that have undergone constitutional changes and wrestled with issues of minorities. Citing various European, constitutions and laws, the authors explore concept of a Jewish State and its various meanings in the light of international law, and the current norms of Human Rights as applied to other democratic societies compatible with liberal democratic norms and conclude that international reality does not accord with the concept which regards a modern, liberal democracy as a culturally "neutral" and a nationally colourless entity. In light of the new political map in Israel and the prospect of future disengagement from the West Bank, Israel and the Family of Nations is essential reading for all those who wish to understand Israel’s future challenges.